The last time Tatsuya Kaname's Mitakihara Magi went through two games in three days was in the 2044 season. That's nearly two decades ago. Well, now the Magi have to go through this turnaround to close out the season, and thankfully, it's against a more easier opponent in the Old Dominion Monarchs in Magia Day 2062, honoring the fourth-year student-athletes of the Class of 2063. But don't think for a second that the Magi are going to sell the Monarchs short. The current iteration of the Monarchs program is actually older than the Magi football program by two full seasons. Of course, despite all that, the world knows where all the national titles are heading off too. But still, Madoka won't ODU short. "No, we can't sell them short," said injured senior fullback Lionel "Shabba" Tshabalala, who will finish with a degree in kinesiology by the end of the Fall session. "That's not what we're all about. Every opponent must be respected and we know they have nothing to lose against us. The guys will need to be ready. I wanna get out there, but I'm hurt and I need to recover." Tshabalala had the misfortune to be injured on Homecoming 2062 against the Navy Midshipmen with a torn abdominal. He will be sidelined until at least the national championship game, should Madoka qualify with a win tomorrow over the Monarchs. In the meantime, fellow senior M.J. Vincent, an English major, has been doing the work at the position for most of the home schedule and will give way to junior Lance Williams tomorrow. "It's tough to have to shoulder the load for Shabba, but I know he will come back stronger than ever. We're gonna need him in our bowl game," Vincent said. The Magi have had trouble recruiting a competent fullback, with two of their recruits electing to commit elsewhere. There is a possibility that one of their recent commits, Canadian quarterback James Stanley—who is on the same MitSS Angels team as Takuto Itsuka, the Okabe brothers and recruit Daniel Hashida—will move to fullback and fill a massive hole left by Tshabalala and Vincent next summer. "We've really made strides to go after Canadian recruits and try to keep them here and build them into world-class athletes with the resources we have," said Coach Kaname. "With a lot of our players leaving the university this year due to graduation, we need to keep our local talent here in Canada and give them incentive to play in front of their family and friends while prepping for the next level. "It's worked its magic in so many ways over the years and we hope it can continue down the road, This program thrives on its Canadian-born players. 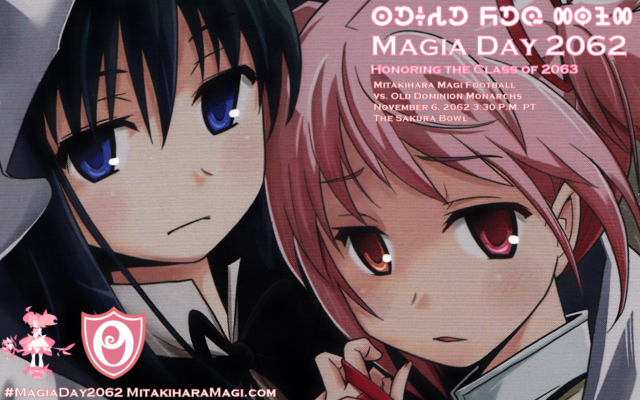 They are the heart and soul of Madoka Magi football."